Mitt Romney’s stretch of good polling didn’t last a fraction as long, but it was fairly solid. Romney lead or tied in eight of ten polls during this period, ranging from a single point to a high of four points. Obama bounced back, leading or tying in five of six national polls, with the only dissenter being PPP for DailyKos/SEIU. (PPP found the race tied with its brand new tracker just a few days later.) Obama’s leads ranged from one point to three, and Romney’s only lead was four points. Phase 4, Oct 18 – ??? Mitt Romney is having a good stretch similar to the one that Obama just had, leading or tying in six of ten national polls, but not as definitive. Romney’s leads range from one point to three, and all three of Obama’s leads are three points. All within the margin of error. The trackers each tell their own story lately. Rasmussen, which remember showed a two point lead for Romney in September when *nobody* showed anything but a strong lead outside of the margin of error for Obama, has been remarkably stable. It has not showed a Romney lead larger than two points since before the conventions and has bounced between 1-2 points for over two straight weeks. PPP’s five results from their new tracker have been Tie, Obama +1, +2, Tie, and Tie. Ipsos/Reuters is the only tracker that showed Obama with a strong lead after the conventions, a good but not strong lead for Romney after the first debate, and Obama coming back after, which is more or less what national polls showed. Obama has shed a four point lead on the 18th to a Tie today. Gallup is still ruining its reputation, showing Romney up by 6 today, and between 6-7 since the 17th. It is not reflecting movements that the other trackers are showing, or national polling. Either Gallup knows something that nobody else — including Rasmussen — knows, or their likely voter model once again is worthless, as in previous elections. IBD/TIPP, which has had accuracy problems of its own and had been leaning to the right to the same degree roughly as Rasmussen, has looked more like a reverse Gallup lately. They reported a tied race on the 18th, Obama up by 1.7 points, 2.6 points, and 6 points on the 21st, now up 4 points today. RAND has shown Obama falling since the 19th, +5.7, 3.1, 2.6, 1.6, and up to 1.8 today. RAND in recent times has never shown Mitt Romney leading, but since this isn’t a random sample of people, it can be more useful for trends than anything else. In other words, IDB/TIPP, RAND, PPP, and Ipsos show the race tightening into a literal tie. Rasmussen isn’t budging off a Romney lead, but remember September. And Gallup is living in their own reality. Electoral college projections haven’t changed much. I have three data points for 13 projections, not all of them new. The most useful projection of course belongs to Nate Silver. Obama was up 289-248 on the 16th, 291-246 on the 19th, and 289-249 on the 21st. Talking Points Memo has Obama up a little from 247 to 259 over that spam, and Romney up and down, 222 to 241 to 191. I’ve contacted one of the authors of the controversial University of Colorado model showing Romney winning 332-208 at first, and then 330-208, to see if I can get regular updates. The average has not changed much at all. Obama was up 264-208 on the 16th, 272-216 on the 19th, and 268-210 on the 21st. 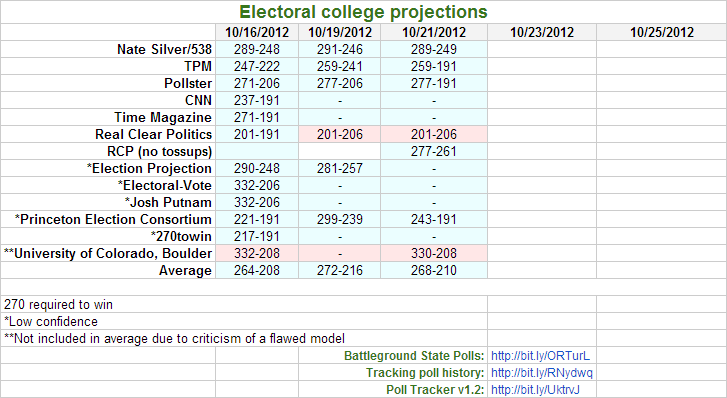 That is somewhat consistent with the Phase 2, 3, and 3 I showed above for national polling. If the election were held today amongst sites that have no tossup states, Obama would win the election 307.5 to 230.5. It’s certainly possible that Romney could win the popular vote this year (by a very slim margin) and lose the electoral vote by a sizable margin. I strongly recommend this story on DKos for its section on what’s going on in North Carolina early voting. Please read the entire thing, but I’ll boil it down for you to this: If Obama keeps pushing up his numbers amongst new voters who are same-day registering and voting like he is, and Mitt Romney is up 1-2% in public polling on election day, Obama could end up winning the state. Read that story to find out why.